MOST WOMEN COVET BEAUTY. THEY GO TO GREAT LENGTHS TO ACHIEVE WHAT IS CONSIDERED BEAUTIFUL IN THEIR TIME. SOME WAYS ARE SENSIBLE BUT SOME OTHERS ARE DEFINITELY NOT. LETS HAVE A LOOK AT SOME OF THE INSENSIBLE AND EVEN GRUESOME WAYS TO ATTAIN GOOD LOOKS ACROSS THE CENTURIES. 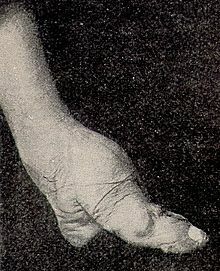 Beginning in the 10th century and ending in the 19th century, foot binding or "Lotus Feet" was widely practiced in China. The four smaller toes of young girls were broken downward, pulled tightly to the heels. 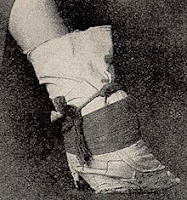 Then both feet were wrapped tightly in bandages so that they wouldn't grow. The bandages were regularly changed and tightened. The process was usually done in fall or winter so that the cold weather could numb the feet, thus reducing pain. Foot binding was certainly painful but it stayed popular for centuries. The main reason was that women with "clown feet" or normal feet were not considered beautiful and would find it hard to get a husband. Around the time of tie Renaissance (14th-7th century), women in Italy put belladonna drops in their eyes to make their pupils large, a mark of beauty. 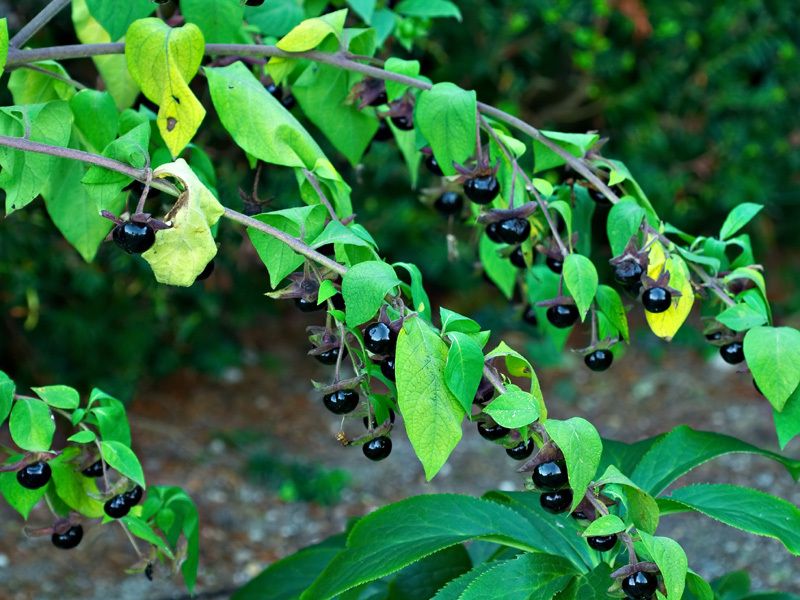 Belladonna, Italian for beautiful lady, is a highly poisonous plant. Women who used the eye drops would get blurry vision and eventually go blind. During the Elizabethan era (1558-1603), a high forehead was desirable in Britain. Women would pluck and shave their hairs to be beautiful. They also use lead-base face for makeup. 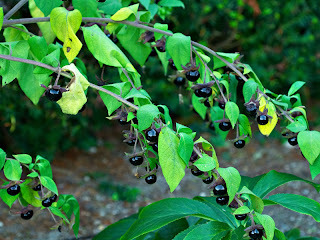 This dangerous cosmetic made many women at that time suffer from chronic renal failure and face-scarring irritations. The latter was the reason why Queen Elizabeth I, a loyal user of the make up, banished all mirrors from her palace. From the 14th to the 19th century, European women wore a corset, a form of waist binding, to make their body get the much coveted hourglass figure. The corset was made of whalebone and hard canvas, and was tightly wrapped around the body with laces, which made breathing and bending difficult. If you see a movie about Europe in those times where women are furiously fanning themselves, swooning, or fainting, that's because they found it very difficult to breath. Some women today reshape their body by having cosmetic surgery. They may endure a tummy tuck, an eyelid surgery, a face lift, a nose job, or liposuction, to name just a few, to improve their physical appearance in a quick, yet painful way. In facelift surgery, for instance, the procedure involves a surgeon making incisions on the face, around the earlobes. Then the skin is raised to get a wrinkle-free effect. Some fat and excess skins, of course, have to be removed. After that the incisions, stitched or metal-clipped, are hidden within the hairline. When the face starts to sag again some time in the future, the same procedure has to be repeated. One of the side effects of this treatment is a loss of feeling in the facial area and reduced muscle flexibility. 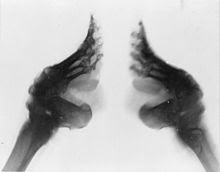 I can't understand why women would want to have a lotus feet. It's pretty rational and understandable if women gets Long Island plastic surgery because they want to become more beautiful. But their feet got hurt for sure during the process but it doesn't look appealing after all.